Slide on wire canopies have become a common part of modern outdoor design for their simplicity, beauty and ability to provide shade when needed and retracted easily when desired. However, they have many draw backs because they are custom made. To fit properly they require precise pre-measurement, fabric and color selection, fabrication and finally installation. Once installed the custom canopies can’t be modified and any repairs (if possible) require a trip back to the shop. 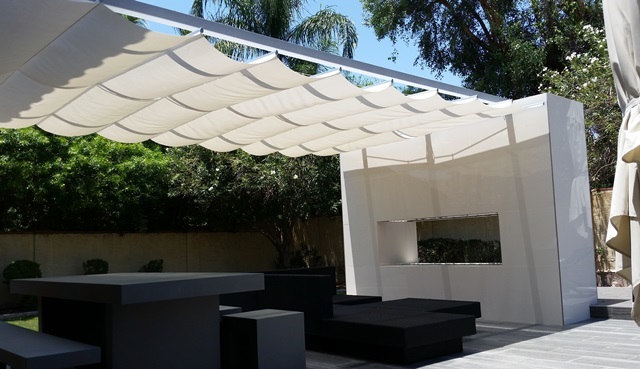 The NOW Patented Infinity Canopy replaces the custom canopies with an infinitely versatile, customizable and adaptable modular and retractable shade system that can be added to any structure, in any size, and in one or multiple colors. Using readily available parts and shade panels, Infinity Canopy eliminates production time, simplifies installation and provides a superior product at a fraction of custom canopy’s cost. Infinity Canopy can easily be installed on pergolas or between two opposing structures. Open it to enjoy the outdoors in full shade and retract it to enjoy open air and full view of the sky. Infinity Canopy is the only shade system that can be modified after installation allowing new and unique designs to be created within minutes for any taste, style and need. Repairs if needed can be easily done on site with replacement parts. There is no need ever to send anything back to a factory. Infinity Canopy is the only shade system that can cover any space regardless of how wide or long it is, without custom fabrication. As long as there is over head cable or other support, Infinity Canopy can be as long and as wide as needed. Each loop of bellowing fabric is an individual panel that seamlessly connect to the next panel to create a canopy section at any desired length. Multiple canopy sections can be installed side by side to cover the width of the space. For continuous shade individual sections, the canopy can be connected end to end to create wider canopy sections. For very long and wide installations, the canopy can connect to 3 or more cables for additional support. 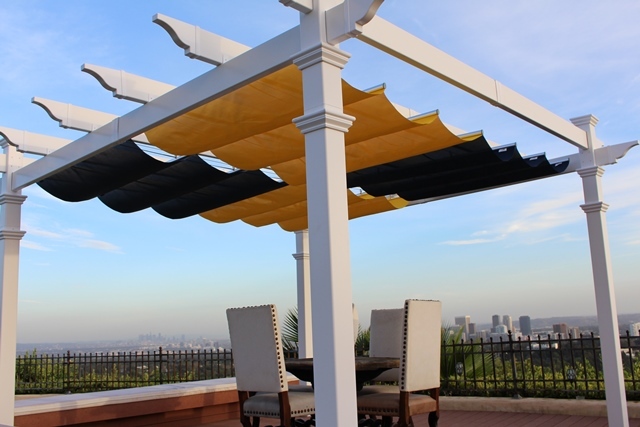 Infinity Canopy uses individual fabric panels that can be easily interchanged within minutes with panels of different color and fabric to create an infinite number of beautiful designs to meet any taste, mood and design need. We have designed Infinity Canopy with the goal to make the beautiful slide on wire canopy style available to the masses and to transform it from a custom and rigid product into a system that is infinitely versatile and adaptable. Ordinary slide on wire canopies are not modifiable once fabricated but not with Infinity Canopy. Enhance your outdoor space and living experience and get the most out of your investment. Infinity canopy provides extraordinary function, beauty and versatility that custom made systems, umbrellas and other outdoor shade systems can never match. How many designs are possible with a canopy with 12 fabric panels in two colors (6 blue and 6 red)? Here are a few examples of infinite possibilities! To learn more about Infinity Canopy and to order our product, please contact Michael Stevens at (310) 890-9182 PST or mstevens (at) greenprojectmarketing (dot com). You can also visit www.InfinityCanopy.com.